ISLAMABAD: Former prime minister and Pakistan Muslim League-Nawaz (PML-N) leader Shahid Khaqan Abbasi on Tuesday was allowed to contest the upcoming general elections from NA-53 after the appellate tribunal rejected objections against his candidature. During the proceedings, the election tribunal declared the returning officer’s decision as null and void. Talking to media persons, Shahid Khaqan Abbasi said that the nation will decide the fate of PML-N now, adding that he has never bowed before anti-democratic forces. The PML-N will again come into power, he claimed. 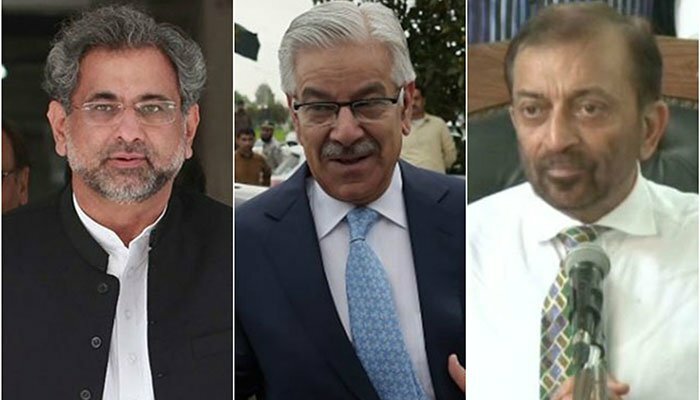 Abbasi also criticised the arrest of PML-N’s ticket holder Qamarul Islam from NA-59 Rawalpindi-III in connection with the Punjab Saaf Pani Company corruption case. Engineer Qamarul Islam, who has served as the chairman of the Saaf Pani Company, is accused of having awarded contracts for 84 water treatment plants at a higher price. “I request the National Accountability Bureau (NAB) to release Islam immediately,” Abbasi said, adding that it was regrettable that a person who had never been probed was arrested all of a sudden. He further remarked that only alleged issues in PML-N were being highlighted. Discussing the upcoming polls, Abbasi observed that questions were being raised on the transparency of the election. The arrest of Islam, the PML-N’s candidate from NA-59, was criticised by the party supremo Nawaz Sharif and spokesperson Marriyum Aurangzeb. On the other hand, the appellate tribunal has cleared Pakistan Tehreek-e-Insaf (PTI) leader Dr Firdous Ashiq Awan from NA-72 and former Khyber Pakhtunkhwa (KP) governor Sardar Mehtab Abbasi. Former foreign minister Khawaja Asif was also given green signal to participate in the elections from NA-73 Sialkot. However, PTI chief Imran Khan has been summoned to record his stance over the petition against his candidature in NA-35. Earlier, a petition PML-N leader Maryam Nawaz’s nomination papers were also dismissed for constituency PP-173 of Punjab Assembly. The tribunal had also rejected the objections regarding PTI Chairman Imran Khan’s candidature for NA-243. Meanwhile, in Karachi, the election tribunal at the Sindh High Court (SHC) cleared Muttahida Qaumi Movement-Pakistan (MQM-P) leader Farooq Sattar to contest elections from NA-245. Sattar’s nomination papers were rejected by RO on the basis of his failure to mention the registration of two criminal cases against him. During the hearing on Tuesday, Sattar told the court that he has availed bail in both cases after which the RO’s rejection was ruled to be void. Separately, the Election Tribunal (ET) of Peshawar High Court (PHC) dismissed appeals filed against candidatures of Qaumi Watan Party (QWP) Chairman Aftab Ahmed Khan Sherpao, PPP stalwart Ziaullah Afridi and PML-N candidate for NA-21 Mardan, Arsallah Khan as well. The tribunal, presided by Justice, Syed Afsar Shah, after examining the record and hearing arguments of lawyers of PTCL and Aftab Ahmed Khan Sherpao, upheld the decision of the NA 23 Charsadda-I RO. PTCL authorities had challenged RO’s decision in the tribunal by taking the plea that outstanding dues around Rs300,000 were pending against Sherpao since 1994, which was overlooked by the RO during the scrutiny of nomination papers. Sherpao’s lawyer contended that all dues of PTCL were cleared by his client and therefore PTCL’s petition may be dismissed. The tribunal also dismissed appeals filed against ROs’ decision for accepting nomination papers of PPP leader and candidate for PK-76 Peshawar, Ziaullah Khan Afridi and MLN candidate for NA-21 Mardan, Nawabzada Arsallah Khan and allowed them to contest the general elections. The petitioner had claimed that Arsallah Khan was possessing dual nationality, which was overlooked by RO concerned and prayed for setting aside the decision of the RO. However, Arsallah Khan’s lawyer said allegations leveled against his client were not true and prayed before the tribunal to dismiss the appeal of the rival candidate. The tribunal also dismissed appeals of the National Telecommunication Corporation (NTC) against acceptance of nomination papers of former MNA and PTI candidate for NA-27, Noor Alam Khan, PTI candidate for NA-28 Peshawar, Amir Ayub, former MNA Engr Hamidul Haq, Naeema Kishawar and allowed them to contest the polls. Another election tribunal, presided over by Justice Musarat Hilal, dismissed appeals of NTC against former MNA Malik Bilal Rehman contesting from NA-42 of Mohmand district, ex MPAs Nasim Hayat, Riffat Akbar Swati and a female candidate contesting on reserved seats, Khurshid Beghum, and upheld the decisions of the ROs. Justice Musarat Hilali observed that all the outstanding dues against candidates fell within the prescribed limits and they could not be disqualified. Meanwhile, an Election Tribunal disqualified Dewan Ashiq Hussain Bokhari, who was Pakistan Muslim League-Nawaz’s (PML-N) candidate from NA-159 for having a “fake degree”. Election Tribunal Judge Mirza Rauf, while accepting the objections raised by PTI candidate Rana Qasim Noon, rejected Bokhari’s nomination papers. Dewan Ashiq Bokhari was an ex-MNA of the PML-N in its recently ended tenure.